I realized my son doesn’t have many white things. He only has two white shirts (he’s wearing one of them in the first picture below) and his most recent artwork done on white paper. I hope this last one counts for this week’s Mommy Moments theme. His most recent artwork done on white paper; he insisted that we tape this on the wall for everyone to see. LOL! This entry was posted in Mommy Moments, White. Bookmark the permalink. Snow White, come and see. One great artist out there soon! 🙂 Yey! What a superb art work! My son also loves to put his drawings up, on the ref naman. : ) Happy MM! great artist naman! so guwapo pa! how i wish my son has artistic talents too… good job to your son! visiting your MM entry! hope you can drop by mine too! ako marami white baby ko..
great art work Justin! i like your white shirt, too! 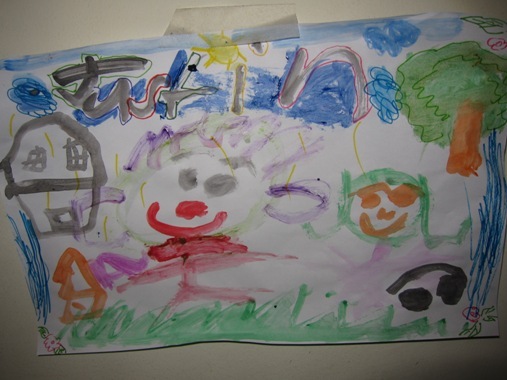 great artwork, justin! my daughter also insists that we display her artwork on the wall. they really do love it when they see their drawings on the wall. cute boy and the artwork was nice, artist in the making! keep supporting! PinayMum – Mommy’s Life Around…wishing you a great weekend. You have an artist in the making. ;D Nice artwork! That’s a very impressive artwork. Btw Sis, do you mind if you visit my newest blogs too? Thanks! nice drawing from a very sweet kid! Are those earphones on the lower right corner of the artwork? 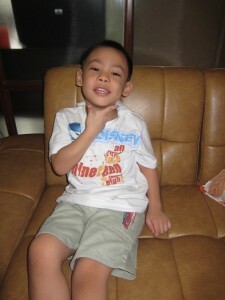 Cute, lovely kid!